Hot tea month is any month of the year, as far as I'm concerned. But someone, somewhere decided that January is officially hot tea month. It is a good month for sitting down with a cup of tea. A little cake alongside never hurt. And some good books to peruse while sipping. I used some of the blueberries I froze last summer for this oh, so tender and not-too-sweet Lemon Blueberry Cake, and glazed it with a lemon and icing sugar mixture. Scrumptious! In another bowl, (can use mixer, but I did it by hand), cream butter and sugar until light and fluffy. Beat in egg and vanilla. Stir in yogurt and lemon zest. Stir in dry ingredients just until mostly mixed. Lightly grease an 8 or 9 inch round cake pan. Scrape the batter into the pan and bake at 350 degrees for 35 to 45 minutes, or until cake springs back when touched in centre. Cool for 5 minutes, then turn out of pan onto a serving plate. Drizzle with lemon glaze (1 cup icing sugar stirred with lemon juice until of desired consistency). Enjoy the last days of January! mmm tea and coffeecake sounds delicious! It is another wintery day here in Alberta which makes your recipe sound even better.....looking forward to preparing some good things in my new kitchen. How are things coming with your renos? We are making slow progress. This looks like a delicious recipe Lorrie. I love a cup of tea on a winter's day. Keep warm! Oh wow...that looks delicious. Now I wish I would have gotten the blueberries on sale at Target. On your header (which I love) are the french knots made while you are doing the blanket stitch? I've never seen that before but it looks awesome. It all looks delicious! How did you make your mosaic? I love it! Your header, title, recipe and photos all conspired to make my heart sing and my mouth water! I agree any month can be hot tea month. 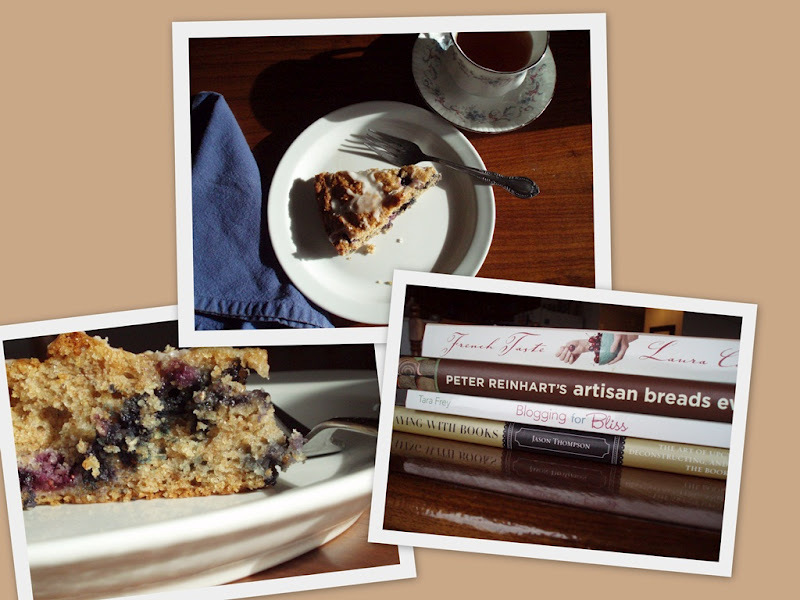 Neat selection of reading material and a piece of cake is just perfect with tea and reading. Mmmm, hot tea, coffeecake and a good book! Blogging for Bliss is such a nice change from the textbook blogging books. Have a great day. Blueberries and anything make a wonderful combination. Looks delicious. The cake sounds yummy...with tea or with coffee! Is February coffee month? I have blueberries in the freezer...might have to try this!! One of my favourite times of the day is afternoon teatime, with cake! This cake looks scrummy, I'll take a nice big slice, please. I love this Mosaic, the shadows across the plate casted from the tea cup. The crumbly cake looks so yummy too! Wish I wasn't trying to burn off the holiday muffin top ;) Love the mosaic, and thanks for stopping by mine. I agree with it being just the two of us, this one week of cooking might actually go a few more days!! I still cook like I have a teenager with her girlfriends eating all the left overs. Yes, February is turning out to be a very good month for tea as well. I just finished some and I even spent some time reading today. It's been so quiet with the snow falling. I'm snagging your recipe as it looks healthful as well as delicious! Lemon Blueberry Coffee cake - yummy.